Zambia’s High Commissioner to South Africa, Emmanuel Mwamba on Friday refused to meet protestors against oppressive Zambian government in Pretoria claiming they were foreign nationals. Mwamba claimed the people who gathered outside the Embassy were identified foreign nationals chanting foreign solidarity songs. He expressed concern at the development especially that a Notice was obtained by two Zambian nationals. 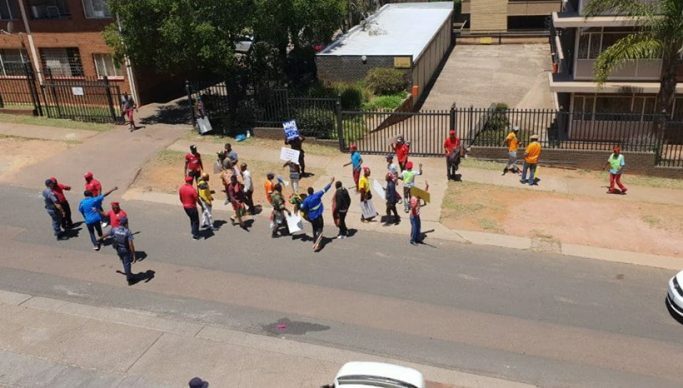 “My office received the Notice that stated that some Zambian citizens living in South Africa would conduct the protest. The permits issued by Thswane Community Safety Metro Police in Pretoria was obtained by Goodwin Mankomba and Evans Kalaba. However, none of them were available,” said Mwamba. “Am applauding Zambians living in South Africa for shunning the protest and for refusing to be engaged in activities that might appear to undermine the image and good name of the country abroad. The group ended their protest at 11:50 hours and had since dispersed,” he said. Mwamba said during the entire episode, the embassy remained open and business was not disrupted by the protestors.